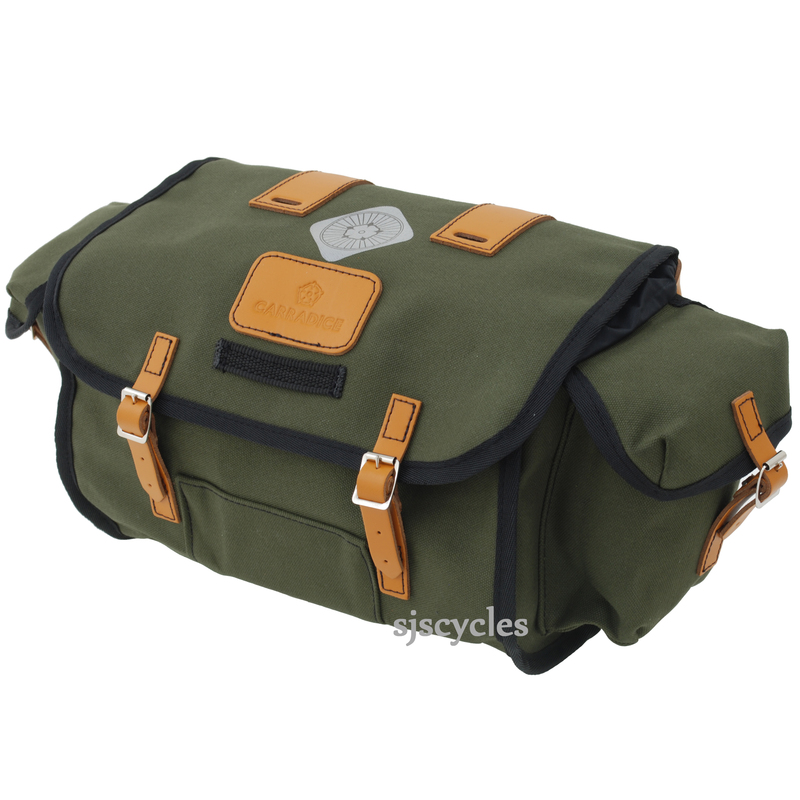 From the Carradice Originals range the Pendle saddlebag was created in response to the increasing demand for a "junior" sized saddlebag but with the added versatility of side pockets. Made from 100% waterproof 18oz Cotton Duck & available in two colours the Pendle fits the bill for those that enjoy day rides. The buckles & fastenings are all metal whilst the straps are made from chromed leather, which means they keep their strength & looks no matter what weather & conditions they face. All Carradice Originals bags come with a lifetime guarantee against defective materials & workmanship. PLEASE NOTE: The colour is much darker when new due to the new coating used by Carradice. The bag will return to this colour in time. My current bike doesn't have rack fixing points, and I was looking for something larger than a saddle pack. I used to have a Carradice Nelson Camper Longflap, so Carradice was the obvious choice. The Pendle is just the right size for a day out. I also love the retro modern green with honey fittings. Great product and great service from SJS cycles. Fits on my Brooks clone well. I am using without the bagman support and it does hit the back of my legs slightly while riding, but not so much as to be an annoyance during a 5 mile commute. I wonder about a longer ride. So far seems to be all it was represented to be. What to use for day rides on a Brompton Folding Bike ? This is perfect. The C bag is too heavy and hard work into head winds, the zipped roll is neat but but way to small.This will take full set of tools in one pocket, wallet mobile keys in the other, big jacket, maps, two drinks,lunch , snacks, full d lock, gloves with room to spare.If you have the extended seatpost on the Brommie this doeas not interfere with the fold and will still go easily in my car.You may have to release the seat tube buckle on a standard seatpost,. So good I left it on, great quality and looks great with a Brooks. Another great buy. I already had the zipped roll and lowsaddle longflap, but needed an 'inbetween' size for commuting. This does the job and the colour goes with the colour of my Fuji singlespeed, which is yellow. I received this together with the Bagman Std Sport. Initial comments were that it looked great. On fitting to the bike with a Fizik Atliante saddle it was a stretch to make the buckles fit, being on the last hole. It was a also a little fiddly. I then went away for 2 days cycling. I could carry enough for a hostel stop. I enjoyed the classic british looks and my colleagues admired it. It was also held in place well. The reflective sticker was not well stuck on though. A good product, but a little more thought towards more modern saddle fixing would have been appreciated. Excellent product, excellent price, excellent service. Thank you SJS. The Pendle is a classic, balanced and well designed. Perfect size for most anything short of a camping trip. It's remarkable to feel so well comported towards a saddlebag, yet I do. Excellent quality.Just right for day ride or even hostel or b&b stay.Highly recommended.Britain at its best. Thanks for your previous answer. I was reading your mega brochure and noticed you suggest (on p 56) anchoring carradice bags to a rear rack with a toe strap, which seems to me like a good idea. But how do you do that? I assumed there must be some dedicated fixing point on the bag. Thanks for your help. There is not a dedicated anchor point for this, as this is not information that has come from Carradice. This is just down to preference. There are lots of places on the bag that could be used as anchor points though. Is it possible to anchor this to a rear rack with a strap? There are no fixing points underneath the bags.